Saving Native American languages[Elizabeth Weatherford is] director of the Native American Film and Video Festival which celebrates its 30th anniversary this year. Dozens of native language films are being shown, including the first to be written entirely in Alaska's Inupiaq language. Sikumi/On the Ice, by Andrew Okpeaha Maclean, premiered at the Sundance Film Festival and was short listed for an Academy Award. "Anything that can activate young people who have been saturated by the American media is really important," says Ms Weatherford. "Film making can make them empowered by the use of language in their own world. It's the transmission of language through culture and there's an effortlessness to it. 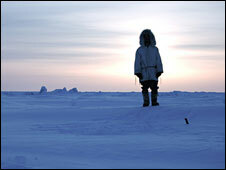 "Below: "Sikumi is the first film to be written entirely in Alaska's Inupiaq language."